Saturday | Do You Hear The Music? 23 days until the second Life is Beautiful festival in Downtown Las Vegas, October 24-26. In anticipation, at DoYouHearTheMusic.com I’ll be running down an artist or two on the lineup! If you haven’t gotten your tickets, do so at www.lifeisbeautiful.com and if you have, awesome and I can’t wait to see you! Ready….OK Go! I know when we announced them people were really excited and for good reason! One, they don’t come to Vegas too often, their live performances are spectacles, their music videos all go viral and they just have a damn good time! Even more exciting, Hungry Ghosts, their fourth studio album drops on October 14 just in time for Life is Beautiful! Catch OK Go on Saturday, October 25. 24 days until the second Life is Beautiful festival in Downtown Las Vegas, October 24-26. In anticipation, at DoYouHearTheMusic.com I’ll be running down an artist or two on the lineup! 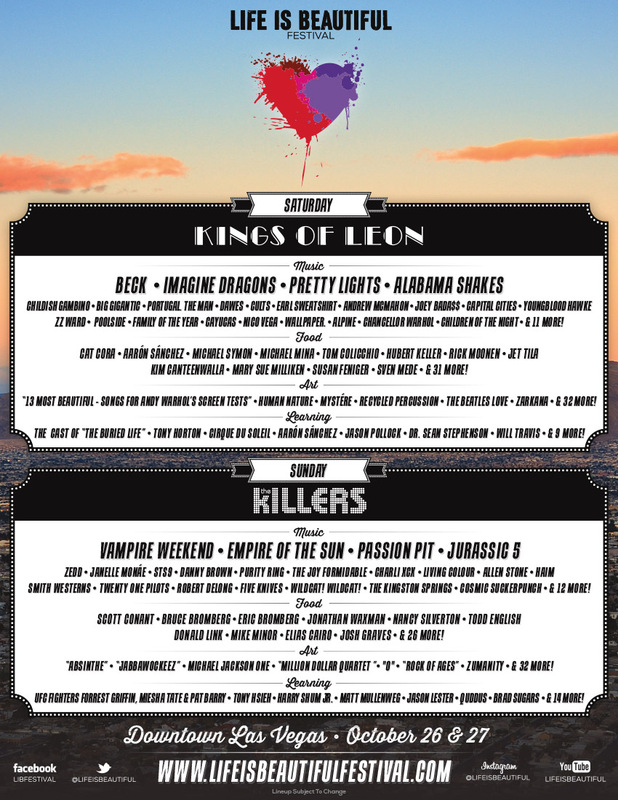 If you haven’t gotten your tickets, do so at www.lifeisbeautiful.com and if you have, awesome and I can’t wait to see you! It’s exciting to know that a handful of artists are making their first play in Las Vegas at Life is Beautiful and here’s another one, Tycho. I’ve spoken to several people who are all amped up about finally get a chance to see Tycho live let alone in their hometown. Currently touring as a four-piece, the brainchild of Scott Hansen has never sounded so good! I’ve had the lucky opportunity to see Tycho a couple times this year and cannot wait for them descend upon the neon desert for what is sure to be an amazing performance. Get ready for an instrumental electronic experience and make sure you carve out time to see them perform on Saturday, October 25.